. 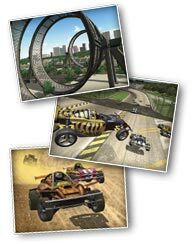 : GLOBAL VR :: Twisted — Nitro Stunt Racing :. Loops and leaps are front and center in this high-flying racing game. 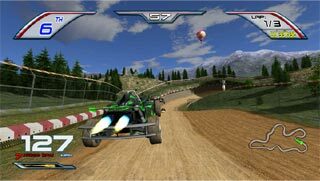 High powered F-Jet racers provide a totally realistic racing experience with fine-tuned handling, air controls and over-boosted engines. Single players can enjoy the heart-pounding action or heighten the competition by linking up to 4 game cabinets. Standard racing rules apply… but that is the only thing standard in this Twisted game! The Aerobatic category is characterized by its twisted and menacing metal structures, which climb high into the air. Controlling speed is essential here to avoid the fatal fall. The Jump category gives drivers one more element to control: the air. The F-Jet's mobile wings and jet engines enable speed and trajectory control during jumps. The Supercross category offers a surface made up mainly of dirt. Controlling drift is fundamental for negotiating the slopes and the bumps well.